My mum is having a baby in her tummy. I'm so excited. I will be a big sister. I hope the baby is a girl. Last week, I went to NUH with my mum to check the baby. After reaching Dover MRT, we took a shuttle bus to NUH building. 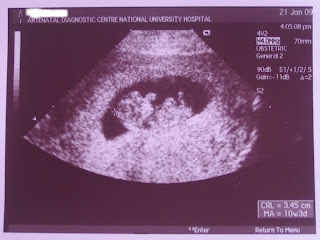 When we reached there, we registered at Clinic G. We also had to go to Antenatal Diagnostic Centre (ADC). It took very long time for our turn so we went for a walk while waiting. At ADC, the nurse took a scan of the baby. The nurse allowed me to see the baby from the monitor. I saw that the baby's hand was moving. It was very cute. At Clinic G, Mum did some talk with the doctor. The nurse also took some of mum's blood, but she didn't let me see it.